While declining store traffic continues to dominate the headlines and remains the reason most frequently cited for lackluster store performance, it’s only part of the story. If it’s true that store traffic has experienced a permanent and intractable decline, then what are brick-and-mortar retailers to do? Today many brick-and-mortar retailers track store traffic and measure conversion, but the question is what they actually do to optimize their in-store conversion rates. The answer for many is not much. In the online world, conversion rate optimization (CRO) has become an industry onto itself, spawning a global community of consultants and service providers, formal methodologies, and over a hundred books dedicated to the topic of Amazon alone. There is only one book on brick-and-mortar conversion listed on Amazon. Given the difficult business conditions so many brick-and-mortar retailers are facing, it’s baffling that CRO hasn’t become more of a focus if not an obsession. Many factors may be preventing CRO from taking hold with brick-and-mortar retailers, but just like online marketers discovered after the dot-com bust, focusing on conversion can help them not only survive but even thrive despite traffic declines. Most major tier-one retailers today track traffic and conversion rates in all their stores, so the basic data needed to conduct CRO already exists. For the retailers that misguidedly use sales transaction counts as a proxy for traffic—sorry. Beyond being a grossly inaccurate measure for store traffic, they don’t even possess the basic data needed to calculate conversion rates, so optimization is a non-starter. In the online world, conversion rates are influenced by a website’s page layout, colors, buttons, call-to-action, and checkout, among other factors. All these variables contribute to conversion, and CRO is the systematic process of tweaking and adjusting these factors in a way that leads to measurable and sustained improvements in customer conversion rate. In physical stores, many variables impact conversion rates, including store layout, inventory levels, merchandising mix, promotional activity, and most importantly, the front-line associates and managers who run the store and serve customers. And herein lies the challenge with CRO for brick-and-mortar retailers—variability. This variability in physical stores not only makes consistently applying conversion improvement initiatives across stores a challenge but also makes measuring results more challenging. Furthermore, new in-store service features like “buy online, pick up in-store” (BOPIS) make calculating and interpreting conversion rates trickier. Think about it. 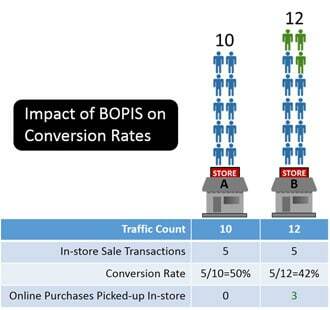 When customers buy online and then pick up their orders in-store, store traffic increases, but conversion rates decrease since the sales transaction was already captured online and therefore not attributed to the traffic count captured when the customer visited the store to pick up his or her order. As the simple example in the illustration shows, BOPIS activity will generally cause conversion rates to decrease. If we compare the customer conversion rate performance of two stores, one with and one without a BOPIS program, we can see how conversion rates can be impacted. In store A, where there is no BOPIS program, calculating conversion is straightforward. This store received ten visitors and completed five sales transactions resulting in a 50 percent conversion rate. Store B received twelve visitors and also completed five sales transactions resulting in a 42 percent conversion rate. However, three of the visitors came to pick up their online purchase. Metrics, such as attach rate, can also be tracked to put appropriate attention on fully maximizing all traffic counts to drive overall performance. While it is possible that these three BOPIS visitors may make other purchases while in-store, it’s reasonable to calculate conversion based on a traffic count excluding these visits to more fairly represent true in-store conversion performance. Initiatives like BOPIS will impact conversion rates; however, they are not necessarily impediments to undertaking a CRO program. That said, extra care does need to be applied to account for how these initiatives are impacting conversion rates prior to initiating a CRO program. The important point is to be consistent in how you calculate conversion rates and then apply CRO initiatives, measuring performance against relative trends. A vital tenet of CRO is testing, and more specifically, A/B testing. In the online world, this is easily accomplished by setting up two variations of a webpage and then directing an equal amount of traffic to each site. Conversion results of website A are compared to website B, and the winner is declared. But A/B testing is much more difficult for brick-and-mortar retailers since, unlike websites, every store is unique. Store layouts, inventory levels, geographic location (including proximity to competitors and demographics of shoppers in the trading area), weather conditions, microeconomic factors, and variations in the skill, experience, and effort of the store staff—all create variability that make comparisons challenging. So unlike online conversion rate optimization where changes can easily be made and consistently applied with a few keystrokes, in brick-and-mortar stores adjusting variables like staff levels, for example, must be applied at the store level. 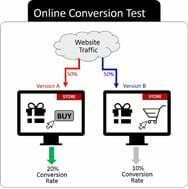 There’s another important difference between online and brick-and-mortar conversion optimization tests—traffic. In an online experiment, traffic can be precisely controlled so that each website version receives the same amount of traffic. In brick-and-mortar stores, the amount of traffic each store receives can’t be controlled and can vary significantly by store. 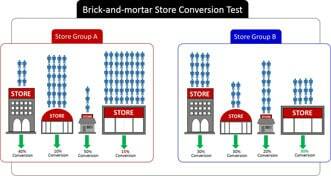 Since conversion rates tend to be inversely related to traffic (in other words, when traffic goes up, conversion rates tend to decline), extra care needs to be applied when interpreting brick-and-mortar conversion optimization test results. But just because the conversion variables are harder to control in physical stores doesn’t mean that conversion rates can’t be optimized or measured using A/B testing. Here’s an example to illustrate. The Test: Simplified Reporting and Conversion Coaching. 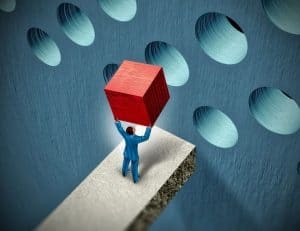 The challenge store personnel have with improving conversion rates is twofold: first, they often can’t easily see where the conversion opportunities are being missed; and second, they struggle with how to adjust behaviors in-store to improve conversion. A series of A/B experiments were conducted with a group of 600 brick-and-mortar stores across four different retail segments. The hypothesis for the study was simple: store managers who can easily spot conversion opportunities and are encouraged to act on this information will outperform store managers who don’t. In each experiment, a sample set of stores was identified and clustered into A and B groups. The group A store managers received a simplified daily conversion scorecard indicating where customer conversion rate sags were occurring along with series of brief conversion coaching sessions conducted by phone to discuss the conversion patterns and behaviors they should consider undertaking to improve conversion rates. Group B store managers did not receive the simplified reporting or coaching. The Result. Group A stores consistently outperformed group B stores. You can read more about the findings at headcount.com/ROIstudy. This article was excerpted from “Conversion Rate Optimization,” which was originally published in 2017. This excerpt was updated May 24, 2018. Check out the full article to learn more about the biggest conversion driver and LP’s role in traffic and conversion.